I am on a path. When the path seems to end, I look around for new steps. Similar to the same steps I have used before. But then I see an odd-shaped stone. It could be the next piece of the path. But it is a different shape. It will only fit if I turn it in a different direction than my path had been heading. I slide it into place, and it takes my breath away a little. To be pointing in a new direction. I’m standing on something that is not smooth, yet if feels more solid than the path behind me. Then I see another shape. Even more interesting than the last. So I try it too. And it has magical powers. Powers to open my eyes. I hadn’t known they were shut. But open eyes can see light. Open eyes can see color. What I had thought was light and color in the past, was only muted shades. A wish for something greater. This shape in my path also feels dangerous. Because now my eyes can see darkness, too. Exposed for what it really is. But would I rather go back? Would I rather not see truth? Even if I wanted to, you can’t unsee truth. A pile of rubble is ahead. Should that mess be on my path? I pause to study it. Like staring at a car crash. Not sure if I should leap into the flames, or let someone else handle it. In the middle of the mess? Staying right where I am feels comfortable. Chasing the glimmer means getting my hands dirty. I may even get hurt. But that sparkle may be the next piece of my path. So I start digging through the rubble. But then another pair of hands is digging with me. And together we unearth the glimmer. It shines and sparkles and glitters like nothing I’ve ever seen before. The light is so bright, I can’t even see the mess anymore. 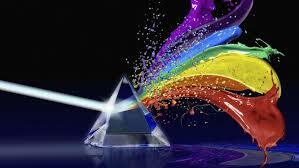 The glimmer is like a brilliant prism. An explosion of love and color and beauty. It is so perfect I forget to breathe. Is it possible this perfection is mine? The strong, steady hands place the prism in my weak, shaking hands. His hands hold mine until I can breathe again. Together, we place the prism in the next step of my path. Because this is what I was made for. I think I could stay on this prism step of the path forever. It’s the best piece I’ve seen yet. Why wouldn’t there be more? So I’ll enjoy the prism for now, so grateful. But I’m also scanning the horizon for the next glimmer. I’ll be ready for the next piece. When it’s ready for me. I’ll follow the strong hands. There is no one I would rather be on this journey with than you!!! So thankful to chase butterflies and sparkles with my bestie!!! !